Apigee Developer Channel Services is a template portal for content and community management. It is based on the open source Drupal (www.drupal.org) project. The default setup allows creating and managing API documentation, forums, and blogs. A built-in test console allows testing of APIs in real time from within the portal. Apart from content management, Developer Channel Services has various features for community management such as manual/automatic user registration and moderating user comments. Role-Based Access Control (RBAC) model controls the access to features on the Developer Channel Services. For example, you can enable controls to allow registered user to create forum posts, use test consoles, and so on. This version of this document has details specific to version 4.17.09. Any references that are specific to previous versions are oversights and should be reported as bugs. Single machine - All Apigee Developer Channel Services components installed on a single machine. 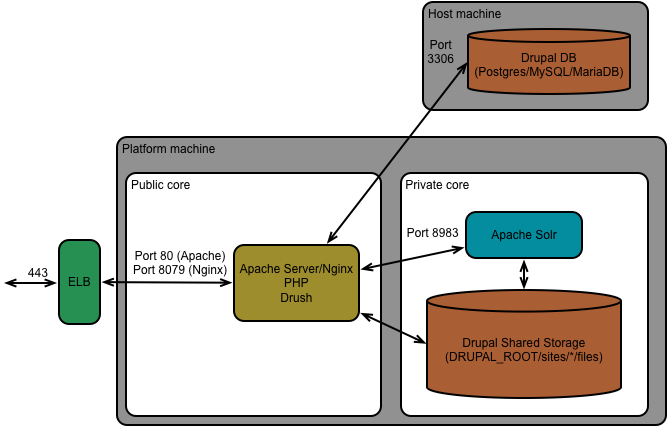 Small - The Drupal database is installed on a separate machine from the other components. Note: These topologies are the only topologies supported by Apigee. If you use a different network topology, Apigee might not be able to support it. Contact your account manager or Apigee Support if you require a custom solution. On a new install of 4.17.09, the installation script installs Postgres and Nginx. On an update to 4.17.09 from an install that uses Postgres and Nginx, the installation script updates Postgres and Nginx. On an update to 4.17.09 from an install that uses MySQL/MariaDB/Apache, you must first convert your installation to Postgres/Nginx before you can update to 4.17.09. In this figure, the Public core contains the components that are publicly accessible. The Private core contains components that are not publicly accessible. An Enterprise Load Balancer (ELB). For example, both Amazon and Rackspace provide Enterprise load balancers for use with their instances. The Apache web server used in previous versions of the portal. The database used by Drupal for new installations of 4.17.09. Apigee, or connect to an existing installation. If you want to connect to a remote Postgres installation, it must be version 9.4. The database used in previous versions of the portal on RedHat 6.x or CentOS 6.x. Apigee, or connect to an existing installation. If MySQL is installed by the Apigee installer, it installs the latest version available for your OS. If you want to connect to a remote MySQL installation, it must be version 5.0.15 or later. The database used in previous versions of the portal on RedHat 7.x or CentOS 7.x. Apigee, or connect to an existing installation. If MariaDB is installed by the Apigee installer, it installs the latest version available for your OS. If you want to connect to a remote MariaDB installation, it must be version 5.1.38 or later. 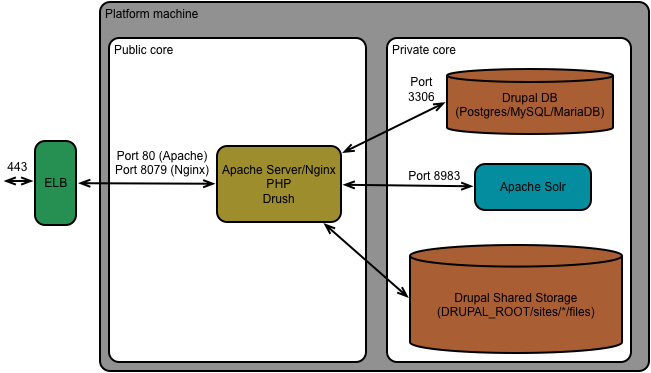 The shared storage area used by Drupal for uploaded files, static scripts, and other information. The Drupal command line interface. The Drupal search server. Apache Solr uses the Apache Lucene search library. Apigee, but it is not enabled by default. Only enable it if you have a large amount of data on the portal. See Developer Services portal requirements for instructions on enabling it.